QUALITY MATERIALS - You'll be able to adjust height, tilt tension, and swivel 360º thanks to the quality-tested pneumatic gas lift and tilt/tension mechanism. 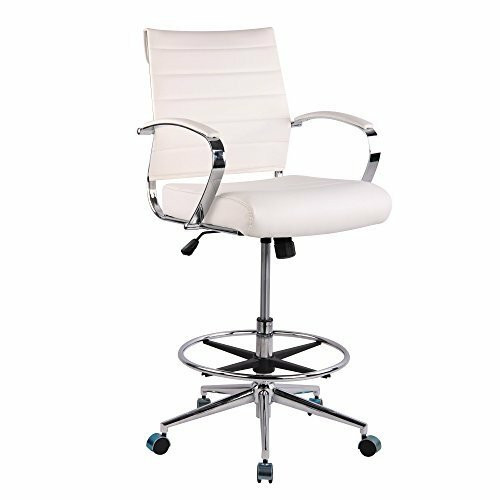 A chrome-coated steel frame and removable arms and a 5 star Cast Aluminum base make the Tremaine Drafting Chair sturdy, and the soft vegan leather material will look gorgeous and last! To ensure maximum comfort and safety, the gas lift may sink approximately 2 inches when extended to the full height. MID-CENTURY MODERN - Make a statement with an adjustable mid-century style chair that completes the contemporary workspace. Inspired by a classic mid-century design, this version shows off clean lines and a sophisticated presence. The Tremaine Drafting Chair is a stylish choice for the home office or professional workspace. HIGHLY ADAPTABLE - A padded vegan leather seat can raise and lower to perfectly adapt to your style, while the footrest ring can spin and adjust to match. With the Tremaine Drafting chair in your workspace, you'll be reaching new heights. WARRANTY GUARANTEE - At Poly&Bark quality is our gold standard. We want furniture that lasts. We work with crafters that we know and trust - crafters who offer the level of quality we know our customers desire and deserve. While we don't limit ourselves to plastics and wood, we do insist on fabulous materials and high-end craftsmanship. Every product we sell comes with a 1-year guaranteed warranty. CHAIR MEASUREMENTS - Overall Product Dimensions: 22.5"W x 22.5D x 39-46.5"H, Seat Dimensions: 19.5W x 19.5D x 22.5-30"H, Backrest Dimensions: 19"W x 16.5"H, Arm Rest Dimensions: 30"H x 22.5"W, Footrest Dimensions: 20"W x 20"L x 9.5-15.5"H, Base Dimensions: 26"W x 26"L, Weight Limit: 250 lbs. If you have any questions about this product by Poly and Bark, contact us by completing and submitting the form below. If you are looking for a specif part number, please include it with your message.